« Who is zee best? 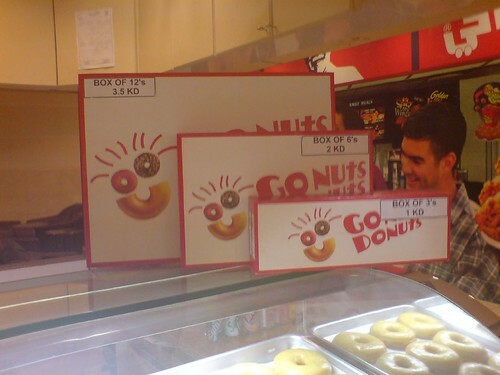 Yesterday while we were at the Marina Mall I noticed the Go Nuts Donuts stall in the food court. 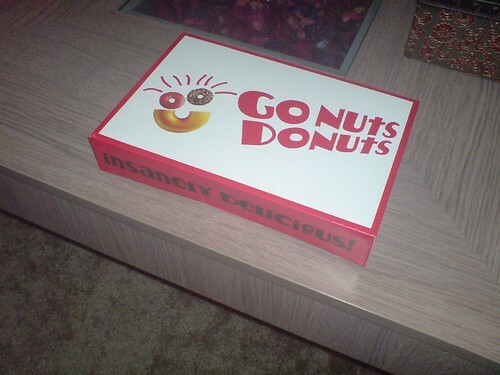 Personally, I’m not much of a donut fan but since we’ve been hearing some noise about them, I thought why not. Since we only wanted a taste, I ordered two (one for Maliha and one for myself), but the guy at the stall said that since it was near closing time, he’d give me 6 for the price of 3. So we ended up picking 6 donuts for KD.1. I got 3 regular chocolate ones, 1 strawberry, 1 choco-ring kind of donut and one glazed bread with chocolate on it thing. Verdict: I think they are pretty good and wouldn’t mind some occassionally. On a side note, they’ve got this new Sambosa restaurant there as well that sells all sorts of samosas. I wonder how the word samosa turned into sambosa when translating to Arabic. I know this is how they say it in Arabic, but why the extra B during the transition?